New jobless claims fell more than expected last week, but continuing claims set a new record for the eighth straight week and few economists expect the labor market to improve anytime soon. The Labor Department said Thursday that initial requests for unemployment insurance dropped to a seasonally adjusted 646,000 from the previous week's revised figure of 658,000. That was better than analysts' expectations. But continuing claims jumped 185,000 to a seasonally adjusted 5.47 million, another record-high and more than the roughly 5.33 million that economists expected. The four-week average of claims rose to 654,750, the highest since October 1982, when the economy was emerging from a steep recession, though the labor force has grown by about half since then. The job market has been hammered as employers, squeezed by reductions in consumer and business spending, cut their work forces. The unemployment rate reached 8.1 percent last month, the highest in more than 25 years. Many economists expect the rate could reach 10 percent by the end of this year. The Federal Reserve said Wednesday it will pump $1.2 trillion into the economy in an effort to lower rates on mortgages and other consumer debt and loosen credit. To do so, the Fed will spend up to $300 billion to buy long-term government bonds and an additional $750 billion in mortgage-backed securities guaranteed by Fannie Mae and Freddie Mac. As a proportion of the work force, the number of Americans on the jobless benefit rolls is the highest since June 1983. The 5.47 million continuing claims also were up substantially from a year ago, when only about 2.85 million people were continuing to receive unemployment checks. The increase in continuing claims is an indication that many newly laid-off workers are having difficulty finding jobs. And even that number is deceptively low: an additional 1.5 million people were receiving benefits under an extended unemployment compensation program approved by Congress last year. That tally was as of Feb. 28, the latest data available. 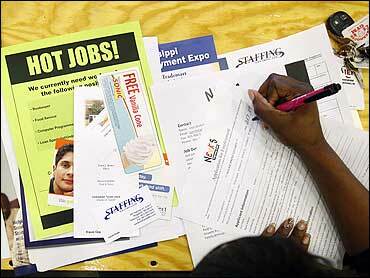 More job losses were announced this week. Caterpillar Inc. Tuesday said it would lay off 2,400 workers as global demand for its mining and construction machines slumps. Mobile device maker Nokia Corp. said it would cut 1,700 jobs worldwide. On Monday, oil producer Baker Hughes Inc. said it would eliminate 1,500 jobs, bringing its total recent cuts to 3,000. And industrial company United Technologies Corp., which makes Otis elevators and Sikorsky helicopters, said it would cut 2,000 to 3,000 jobs, on top of 11,600 layoffs it announced the last week.